*Click here for Part I. Okay, moving right along in the toile draping process. At this point, you should have 2 pieces of fabric pinned to you, with the neckline marked, and the shoulder seam pinned. Now, we’re gonna mark the armscye. 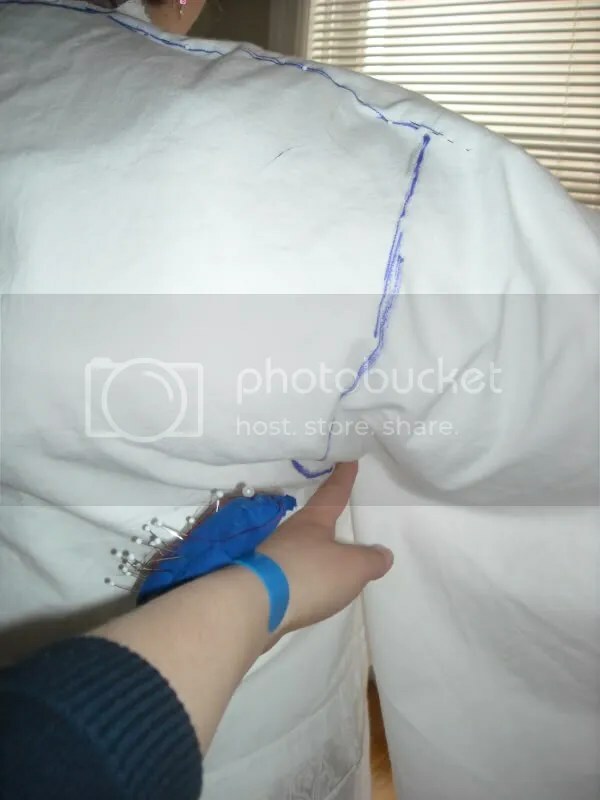 Get out your pen/marking implement/sharpie and mark the end of the shoulder and the armpit crease on both front and back while you smooth the muslin upwards. When you mark the armpit crease, have your drape-ee (person being draped) slightly raise her arm and get as close to the armpit as you can. I’ve made the mistake of cutting too far down, and had to fix this with some extra muslin and duct-tape. And it wasn’t pretty. You probably wanna use a pen or pencil (not sharpie) for this so that you don’t get rub-off on the chemise. At this point, you can draw a curve connecting the marks/dashes you just drew. This is more of a visual aid, and the armscye can be changed later. It really does help, however, to see where you should snip off the excess fabric. Since the period armscye was dropped, don’t cut/mark any further down than about mid-bicep. Just for safety reasons, of course. The armscye curve. It does fit closer to the body, but is hanging a bit-looser in order for the photo. Next, we’re going to pin the side seam. 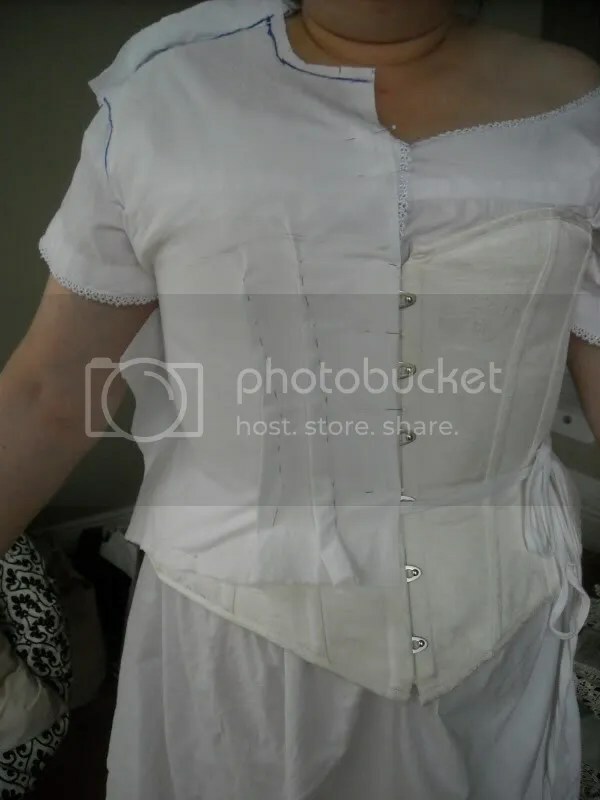 To do this, grab both front and back pieces of muslin and pin them together at the side of the body (*Note: the period side seam was angled a bit and we will draw this line a bit later on). 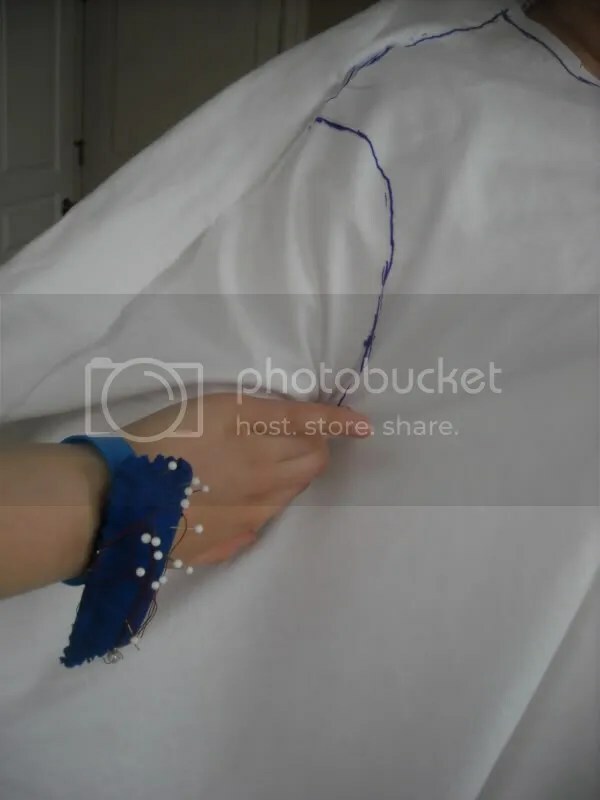 To do this, smooth the fabric up on the front muslin piece while you bring the fabric from the back and pin the two together. Do not pull the front muslin piece taut! You want it to fit well aboce the corset line and the shoulder, but you should have excess fabric hanging below the bust line. This will be used in the next step to make the darts. After the fabric is pinned, it’s a good idea to go over the pinning line with a pen so you have this for reference later on when you draw the proper seam placement. Snip off the excess fabric at the side seam, but leave about a 1-2″ overhang/allowance. It should look like this when you’re done. The period side seam has already been drawn on this piece since I forgot to take a picture of the pinning step during the draping. Finally, the darts. I’m going to apologize from the get-go because I completely forgot to take pictures of the process until after the darts were formed. So, I’ll try to explain it as best as I can, and let me know if you have questions about this step. 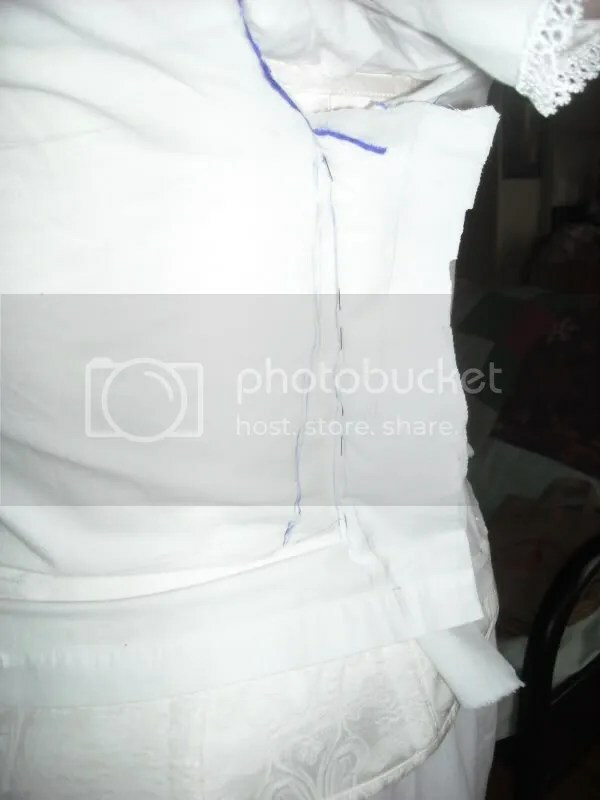 You should have now 2 pieces of fabric pinned at the side and shoulder with necklines drawn on both pieces. With the excess fabric that’s hanging out from below the bust line, begin pinning the fullness out into 2 roughly similar-shaped darts. To do this, starting approx. 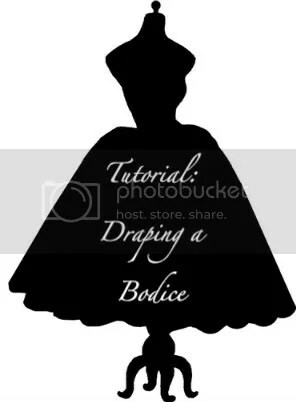 3″ away from the center front, pinch the fabric from the bottom of the bodice, and keep pinching as you pin to roughly the bust line, tapering to almost nothing at the top. The dart closest to the center front should be a bit higher up than the dart near the side seam. It’s also a good idea at this point to draw the dart lines by using a pen to trace over the pins that are holding the darts together. This makes things significantly easier when you go to make your final pattern. That’s it for now, darlings. As always, let me know if you have any questions or need clarification on anything. Next up: marking the period seam placement for the shoulder and side seams! Click here for Part III!